Do you have the cutest dog in the world? It's time to find out with the world's best digital dog show. Welcome to PuppyWars! PuppyWars is a game for dog lovers to settle the age-old question: Who has the cuter dog? Take some pictures of your pooch and challenge another user's dog by opening it up to a world-wide vote. After 3 days the pup with the most votes wins. Don't have a puppy you say? DOESN'T MATTER, we need your votes to help determine who has the cutest dogs in the world. 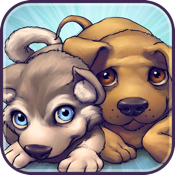 Puppy Wars isn't just a game, its also the best way to see adoptable dogs on your iPhone. Visit the Adoption section to see dogs up for adoption in your area. You can view pictures and information about the dog, and easily tap to call or email the shelter. We can't wait to help these dogs find homes.